BENJAMIN KRETZMANN, M.D. F.A.C.P., F.A.C.R. 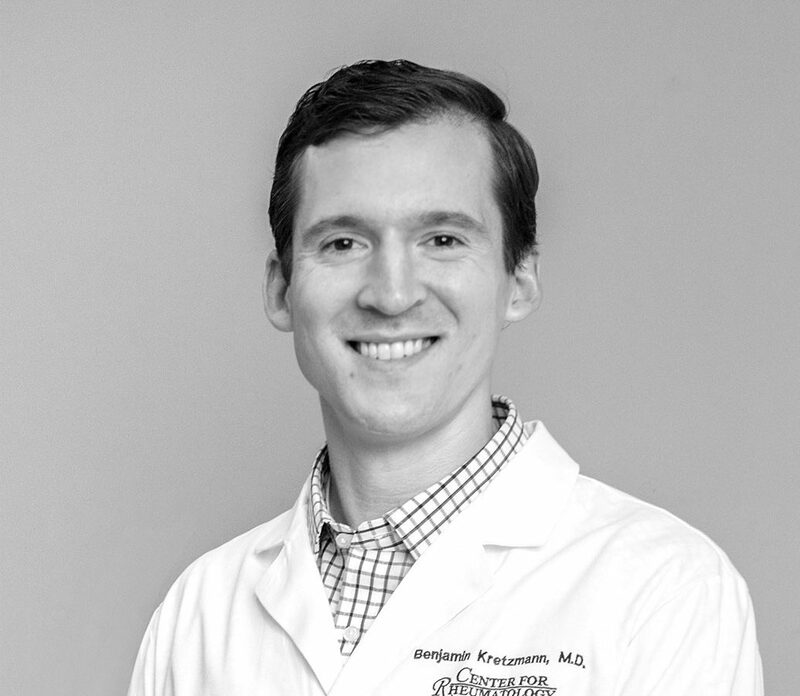 Dr. Benjamin Kretzmann is a fellow of the American College of Rheumatology and joined the Center For Rheumatology in 2014. He received his undergraduate degree in Biomedical Engineering from Northwestern University with honors in research. He completed his medical degree at the University of Florida. Dr. Kretzmann next completed internal medicine residency at Cedars-Sinai Medical Center and his rheumatology fellowship at UCLA. He is conversational in Spanish. Dr. Kretzmann specializes in ankylosing spondylitis, Behcet’s, chondrocalcinosis, fibromyalgia, gout, myositis, osteoarthritis, osteoporosis, polymyalgia rheumatica, psoriatic arthritis, rheumatoid arthritis, systemic lupus erythematosus, systemic sclerosis, Sjogren’s, tendinitis, and vasculitis. He has been trained in musculoskeletal ultrasound and performs imaging-guided procedures in the office. Dr. Kretzmann has research experience through UCLA in the immunogenicity of anti-tumor necrosis factor agents. He also has experience with the correlation of extra-articular manifestations of rheumatoid arthritis with citrullinated protein antibodies. He has participated in clinical studies at the Center For Rheumatology.